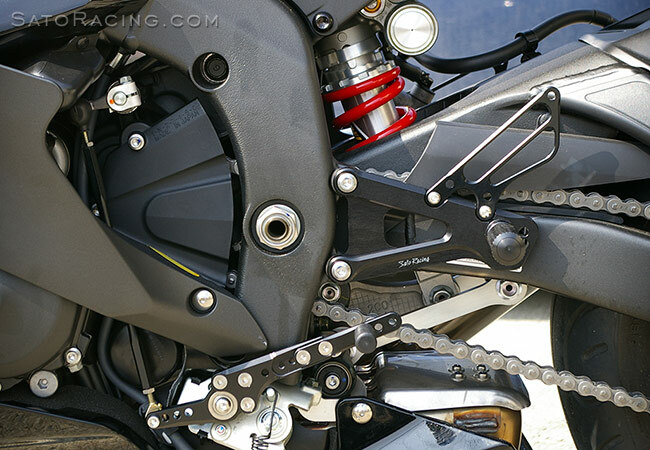 SATO RACING Rear Sets for 2006-16 Yamaha YZF-R6 are CNC-machined from high grade billet aluminum and anodized in your choice of all Black, or Silver or Gold finish with a Black shift pedal assembly. You can choose from 8 adjustable Foot Peg positions, ranging from a near-stock position to more aggressive positions that bring your feet higher and further back compared to stock. 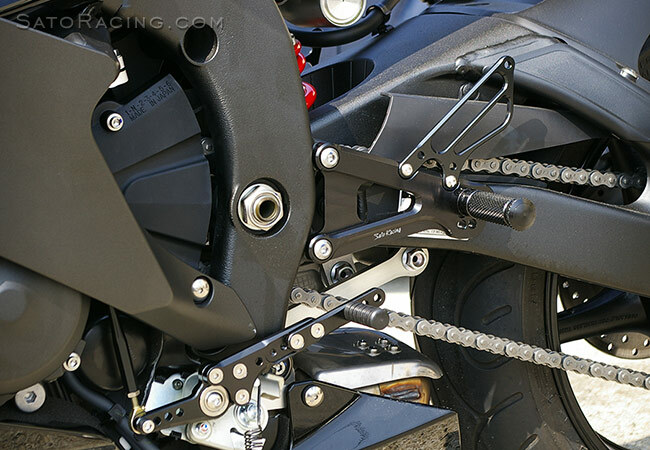 These Rear Sets can be switched from stock shift pattern to reverse (GP-style) shift pattern by changing the angle of the stock shift arm. 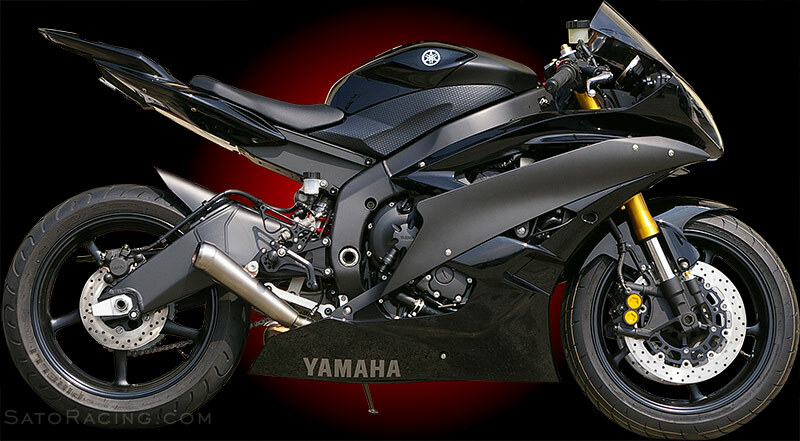 (Some fairing mods may be needed to use the reverse shift pattern). 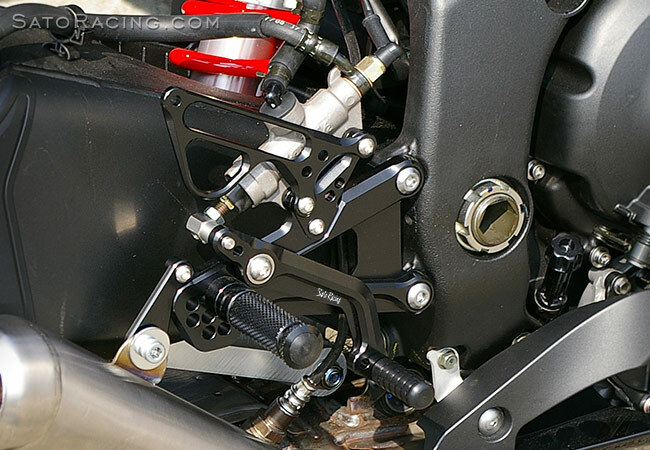 The Step Plate provides 8 possible mounting positions for the Foot Peg. 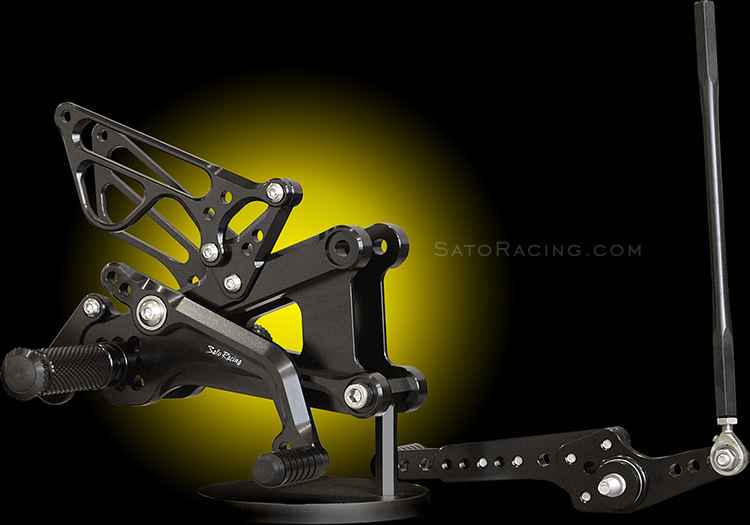 The position of the Pedal Tip is also adjustable. Our Foot Pegs have a finely knurled pattern for excellent grip, along with a comfortable, intuitive feel. 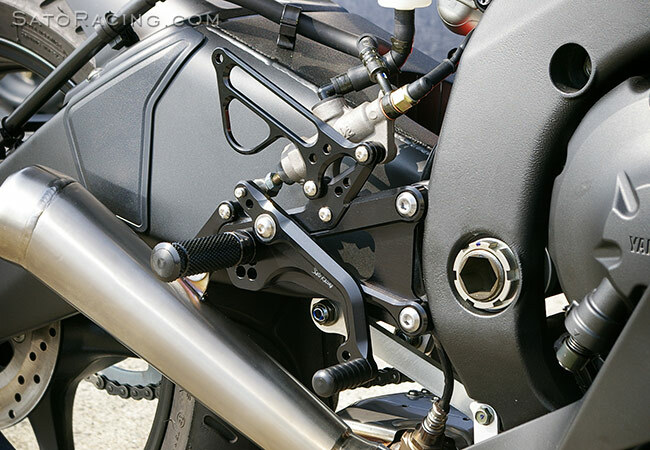 The Rear Sets kit includes a hydraulic brake light switch which attaches at the top of the master cylinder. 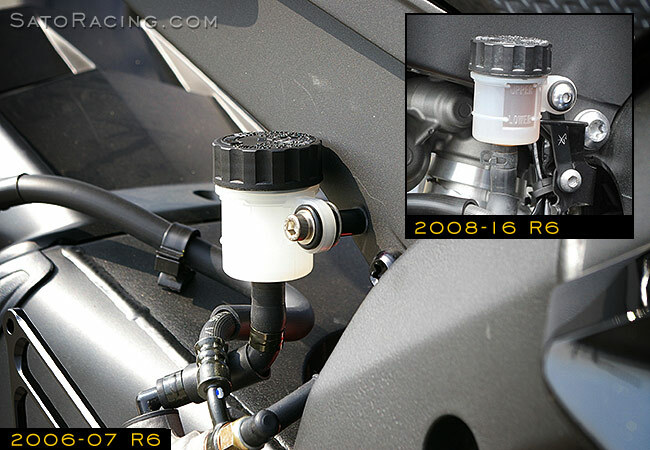 The Rear Sets kit includes hardware for relocating the stock brake fluid reservoir on 2006-07 R6. For 2008 and up R6 , you can use one of our Universal Brackets part# UB-M650 (sold separately) to relocate the reservoir. (see inset). 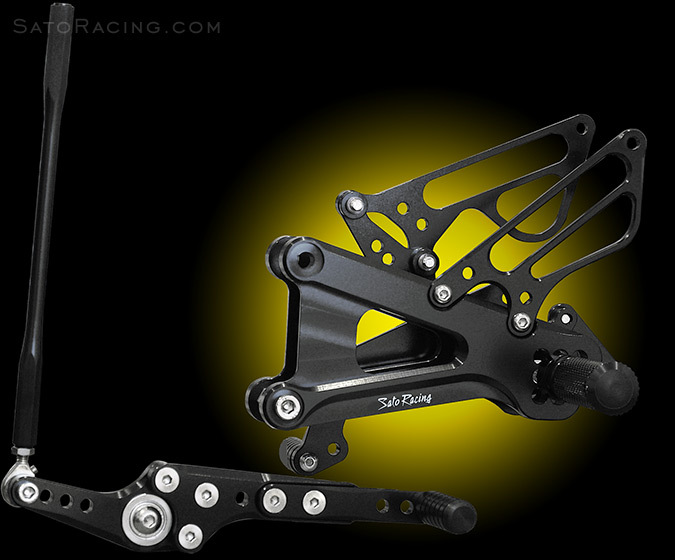 NOTE: Shift pedal assembly comes in black only. Stock shift pattern is shown in above. For reverse (GP-style) shift pattern, flip the stock shift arm the opposite direction. NOTE: For reverse shift pattern, to eliminate interference issues with the shift rod and the inner edge of the fairing, you will need to trim that part of the fairing. the stock brake fluid reservoir on '08-'16 R6. Some additional parts such as Rod Ends and related hardware can be found HERE.